Human chorionic gonadotropin is a hormone found only in pregnant women's placenta. Women have no significant role, but for athletes has some very interesting features. HCG Pregnyl 5000iu is a post cycle steroid. 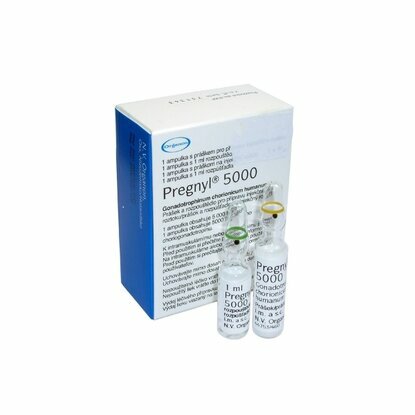 HCG(Human Chorionic Gonadotropin) is a natural protein hormone which develops in the placenta of the female body during the early months of pregnancy. It is used to cause ovulation and to treat infertility in women and to increase sperm count in men. HCG, for men steroid users, mimic the action of LH (luteinizing hormone) in the body that gives the signal to the production of testosterone in the testicles. After a long period of administering anabolic steroids, LH ability dramatically reduces. Even when the LH has been resumed to its normal levels, the testosterone levels may not return to normal. For women athletes, HCG is useless because it will not give any performance enhancing qualities. HCG is not a perfect remedy to prevent the loss of strength and mass and does not help in reestablishing the normal hypothalamic/pituitary testicular axis. After the HCG is interrupted, experienced athletes and bodybuilders often take Clomed(Clomiphene Citrate) and Clenbuterol(Clenbuterol Hydrochloride). The dosage is 2000 - 5000 IU every 5 days and should only be taken 4 weeks because it could permanently repress the production of gonadotropin in the body. In the box are 2 amps, 1 has the powdered HCG in it and the other has a diluent in it(solvent, bacteriostatic water).